According to a few sources, this upcoming season players will be allowed to use Japanese Pokémon cards (from Diamond and Pearl to Rising Rivals) in 10% of their decks (i.e. 6 cards). This is a reversal of the original report that Japanese cards were going to be totally phased out; only English cards were to be allowed in decks during tournament play. This means that you can still use your Japanese Uxie LV.X’s, Leafeon LV.X’s, and any otherwise extremely expensive English Pokémon cards. I personally feel that this ruling really did not change much. From what I have seen, most players that do use Japanese Pokémon cards in their decks only use an average of below 6 cards anyway. I do not know of anyone that uses more than 6 Japanese cards in their deck. They only use Japanese versions of a few costly cards. I was looking forward to seeing only English cards from now on as this would eliminate any confusion, especially for new players. 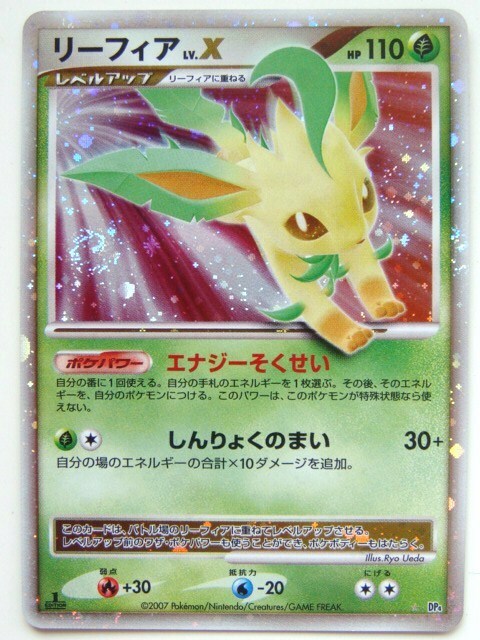 The supposed plan is that only English Pokémon cards will be allowed from the 2010-2011 season and onward. What do you think of this ruling? Comment below to let us know your opinion. If you know Photoshop or Translating or making website or programming,join this site today and you can earn a lot of money. I was quite delighted to find this blog. I wished to thank you for this outstanding read!! I definitely loved every piece and I have you bookmarked in order to check out brand new things you post. Youre not the typical writer, man. You definitely have something powerful to add to the net. Your theme is so powerful that you could almost get away with being a poor writer, but you’re even wonderful at expressing what you have to say. Such a fantastic weblog. I’ll return for more. I am grateful to get observed this site. Hold up the beneficial postings. Wow! I can’t believe I have found your blog. Very useful information. Youre not the average web site writer, man. You definitely have anything powerful to add on the internet. Your design is so powerful that you simply could almost get away with being a bad writer, but youre even amazing at expressing what you have to express. Such a excellent blog. Ill be back for far more. Finally, I found the information I was looking for. I have been doing research on this subject, and for four days I keep entering sites that are supposed to have what I am looking for, only to be disappointed with the lack of what I needed. I wish I could have located your website sooner! I had about 40% of what I was looking for and your site has that, and the rest of what I needed to complete my research. Thank you and I will report back on how it goes!